Desert Tortoise poster above is available from AZ Game and Fish in limited quantities. So maybe they don't fly, but you just can't help but love this great denizen of the desert. 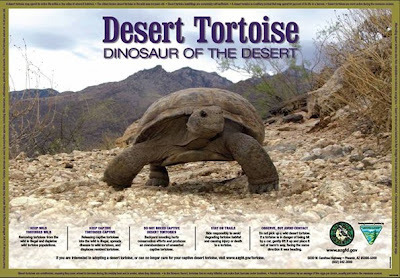 On October 1st at McDowell Mountain Regional Park it is the Grand Opening of the Tortoise Habitat along with a Tortoise Adoption Awareness Event. Join other tortoise lovers in celebrating the opening of this beautiful, huge tortoise exhibit and meet Scarlett, Lady, and Lily who will move into their brand new ‘digs’ at McDowell Mountain Park. Due to the many foreclosures and people moving in Phoenix, there are many tortoises in the care of the Phoenix Herpetological Society that need new homes. Find out how you could adopt a tortoise into your family—a lifelong commitment. 10:00 AM to 11:00 AM, Friday, October 1st at the McDowell Mountain Regional Park Visitor Center. No registration required, park entry fee is $6 per car. For more info Contact: amyford@mail.maricopa.gov 480-471-0173 x201. Do turtles make good assistance animals? Sure, if you're a disabled turtle.